There’s a distinctive image that can be seen around New Orleans on Ash Wednesday each year, and it’s not a dark gray cross on people’s foreheads (though there’s that too). It’s the sight of oak trees blooming with beaded necklaces. 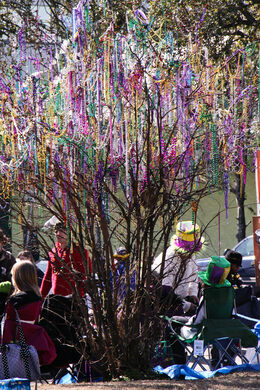 They dangle from the tree limbs in all their tacky glory, colorful plastic remnants of the previous day’s festivities. 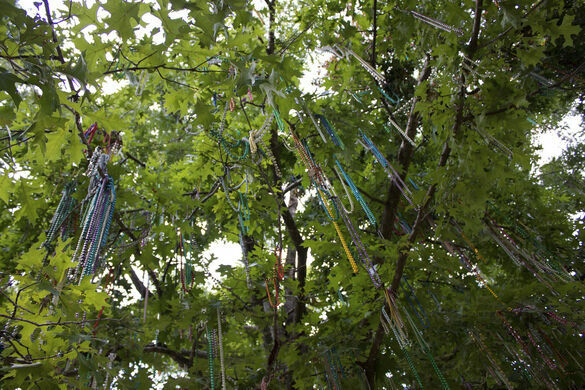 Thousands of beads and other trinkets are tossed during the Mardi Gras parade, and many of the necklaces get tangled up in the branches along the route. The next morning the green trees are raining with loops of purple, gold, and green (the colors symbolizing justice, power, and faith). There is actually (and somewhat controversially) a dedicated de-beading crew that spends the days after the festival cleaning up the branches, especially when the beads present a danger to the tree. But many of these bejeweled trees will stay that way all year, until the next Carnival. Such is the case with the campus Bead Tree at Tulane University, on the Gibson Quad. Walking back to the dorms from the Mardi Gras parades, students will throw the beads they don’t want onto the tree for good luck. If they stick, that student will, supposedly, pass all of their classes. Just don’t walk under it during a wind storm! 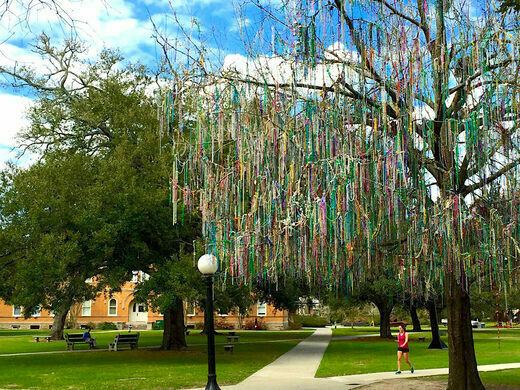 You can take the streetcar to the front of Tulane University and walk from there to the campus Bead Tree. 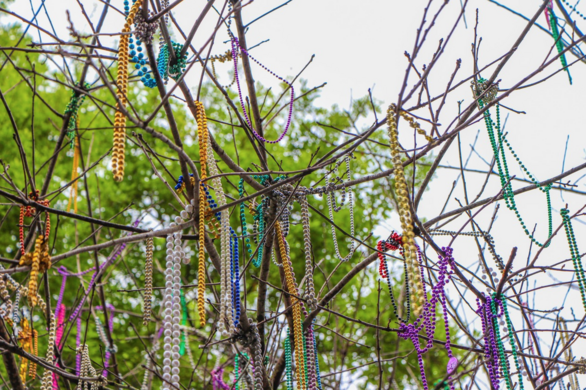 There are also many bead trees along St. Charles Avenue in the Garden District, between Felicity and Martin Luther King Jr Blvd.